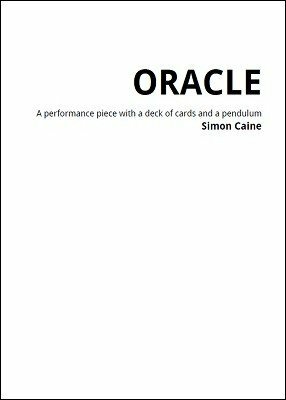 Oracle is a multi phase performance piece with a pendulum and deck of cards by Simon Caine. To demonstrate the powers of the pendulum, first it is used to divine a freely selected card. Next, the pendulum is able to answer questions from the audience, completely out of the hands of the performer. The selected card is then lost and mixed face down into several others by the participant, and still, the pendulum is able to 'dowse' the selection, using nothing more than the participants unspoken thoughts. Finally, a card is merely thought of by another audience member. The pendulum reveals this in a way guaranteed to create a stunned silence. Oracle is a perfect 'moment-maker' routine for those special occasions where your show takes a more mysterious turn. Suitable for stage, close up and parlour style performances, and also includes a routine using the Major Arcana of the tarot.